Our Princess Moon Rune delivered 3 healthy little kidds on Valentine’s Day! 2 doelings and a buckling. Delivery went very well and all the kidds were up nursing right away. They have been bouncing around ever since. We’re only posting the buckling for sale at this point. 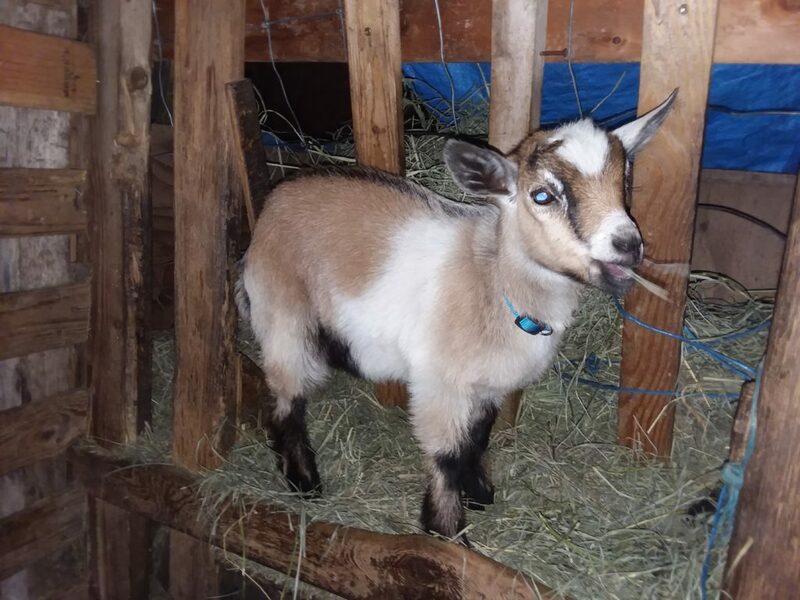 Cupid is very sweet and dashingly handsome buckling. We’d love to keep him intact as his features are striking and he would be a beautiful addition to any Nigerian Dwarf herd. Sire is Angel Wings Prince, 2017 LA 82 D1769320. Dam is Moon Rune Secret 2017 LA 83 +V+V,7*M D1775185 and has a fabulous personality (she’s our circus goat). She’s also one of our favorite milkers. All around wonderful genetics and handsome to boot. $250 ADGA registered, $100 deposit at reservation. Will be disbud shortly. Closed herd, recent bioscreen herd check was negative. will be ready to go around early to mid March, unless you want to bottle feed, then he’s ready when you are. More info available in request. 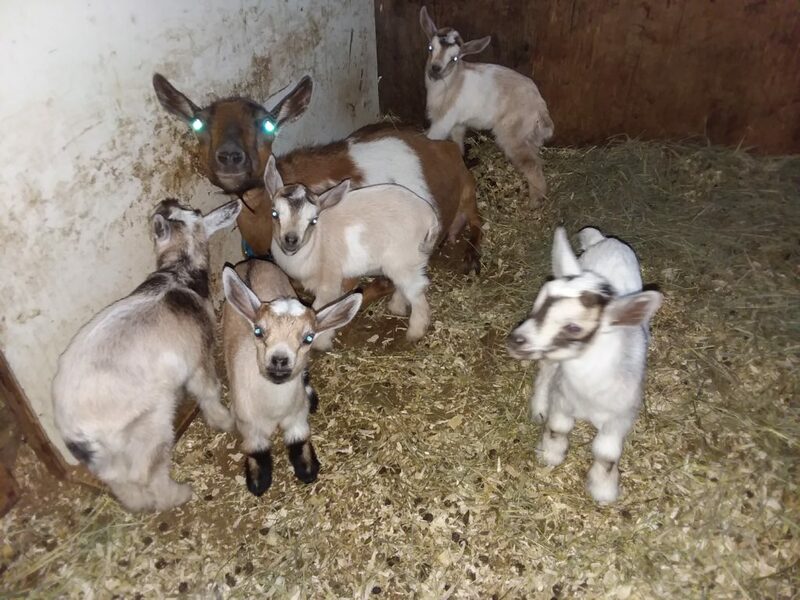 The Smithshyre has 6 bucklings for sale. 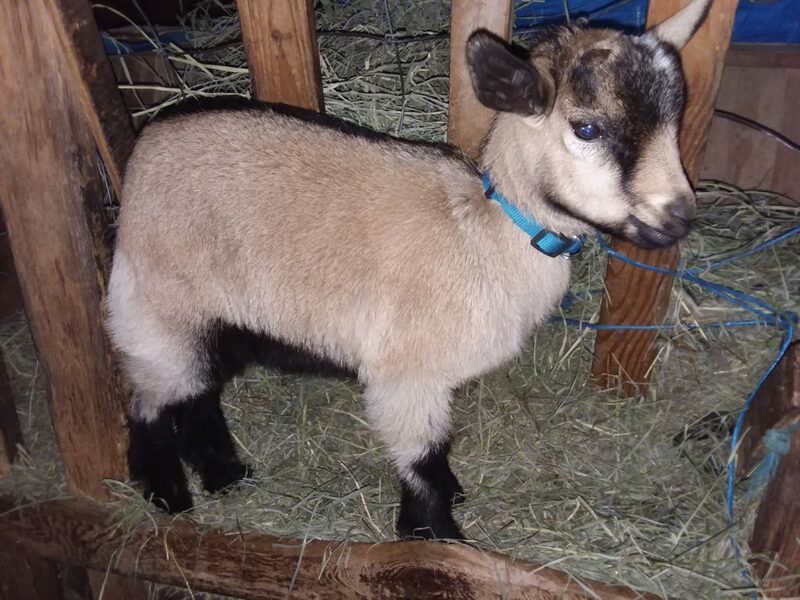 The Smithshyre has six very handsome buckling/wethers available. Email thesmithshyre@gmail.com for more info or to reserve. Thanks! 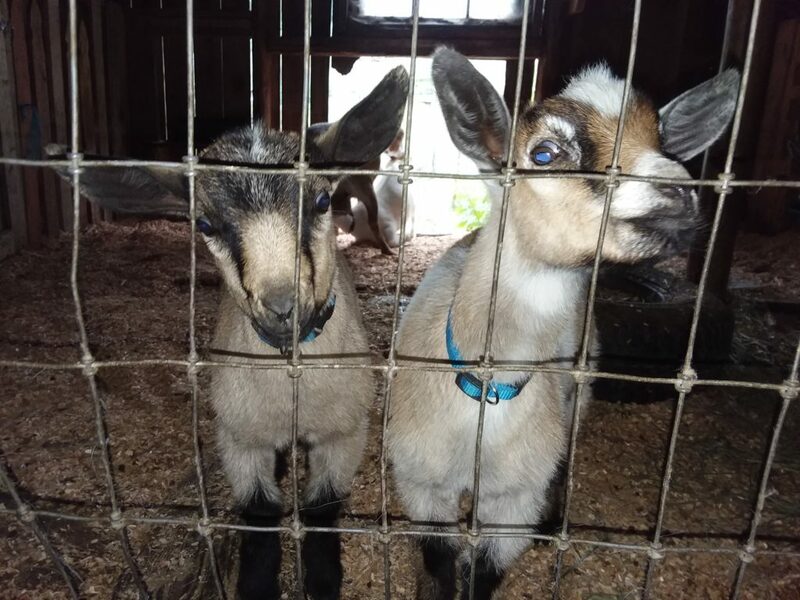 Felipe (white belly band) and Ricardo (brown with black dorsal stripe) were born on Cinco de Mayo this year and will be ready to move to their new home July 5th. They are currently for sale, intact for $250 each (there is already a buyer if they are wethered). They have not yet been registered, but I will do this upon request and deposit of $150. Dam is Smithshyre Arwen (DOB 2/3/17 D1844961) this is her first freshening and she is putting out a quart of milk each morning (we have not started evening milkings on her yet). Her dam is Evenstar (D1718253 2017 LA 85 VVE+ and achieved advanced registry stars for both fat and protein in her first freshening). Sire is Angel Wings Prince (DOB 3/2/16 D1769320, 2017 LA 82 +V+). He is a very handsome buck and sired 21 kidds for us this season. He comes from strong lines. 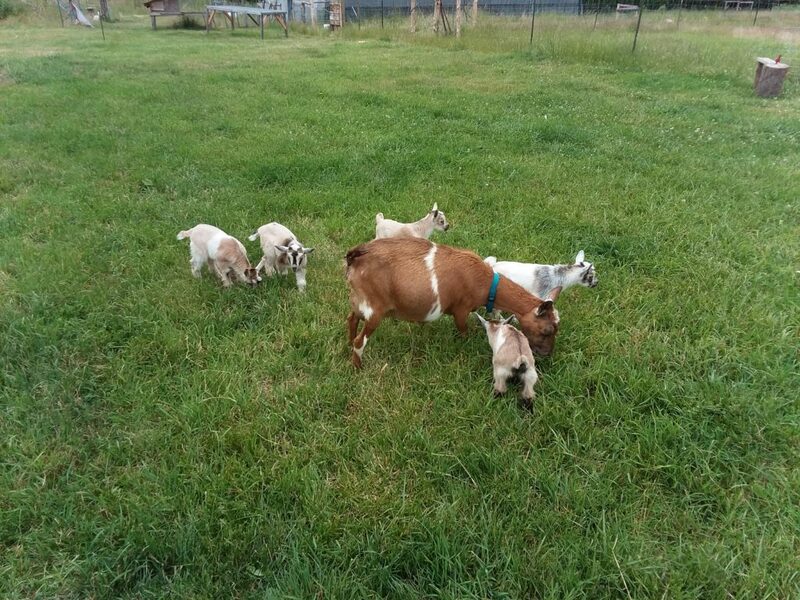 One June 6th, our beloved herd queen Addie delivered quintuplets! 4 bucklings and one doe (being retained). They will be available Mid-August (depends on their size) $300 / buckling or $100 as wethers. Bucklings will be registered upon request and deposit of $150. Dam is Addie (Bellafire WH Against All Odds D1613352 6* AR 2016, LA 2014 80 VA+A+- has since improved, but LA 2017 assessor refused to score her due to “not being able to read her tattoo”). This is Addie’s 4th Freshing on The Shyre and she has incredible milk production, as does her daughter (which is why we are retaining this one also). Sire is Angel Wings Prince (DOB 3/2/16 D1769320, 2017 LA 82 +V+). We run a closed herd and have tested CAE and CL clear again this year. Babies have all had their first CDT vaccines, hoof trims and disbuddings. We use Molly’s Natural Wormer and feed only certified organic feed.